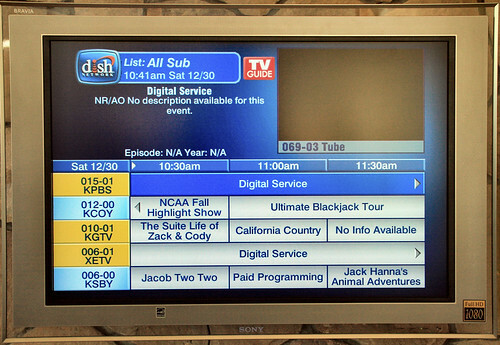 Our DishNetwork reciever picks up over the air (OTA) digital signals, in addition to ones from Dish's own satellites. KPBS, KGTV and XETV transmit their digital signals from Mt. Soledad, San Miguel Mountain and this hill in downtown Tijuana, respectively. I am watching these from a point almost exactly 200 statute miles from KPBS' San Miguel transmitter. By the way, note the channel numbers on the left. KPBS is identified as 015-01. That's what it's telling the receiver, because it has two digital channels (this is the first, or 01, while "Create" is the second at 02), and is "branded" as Channel 15, where its analog signal has been for the duration. In fact the station transmits on Channel 30. Likewise, KGTV is known as Channel 10, while its digital signal (what we're looking at here) is actually on Channel 25. XETV, known as Channel 6 throughout its analog history, is actually on digital channel 23. KCOY and KSBY are still on channels 12 and 6, respectively, with their analog OTA signals. What we're seeing here is what Dish picks up with an antenna on the ground somewhere, and then bounces off a geostationary satellite 24,000 miles above the equator, and back down to us as one among the rest of Dish's "channels", all of which are just data streams, really.